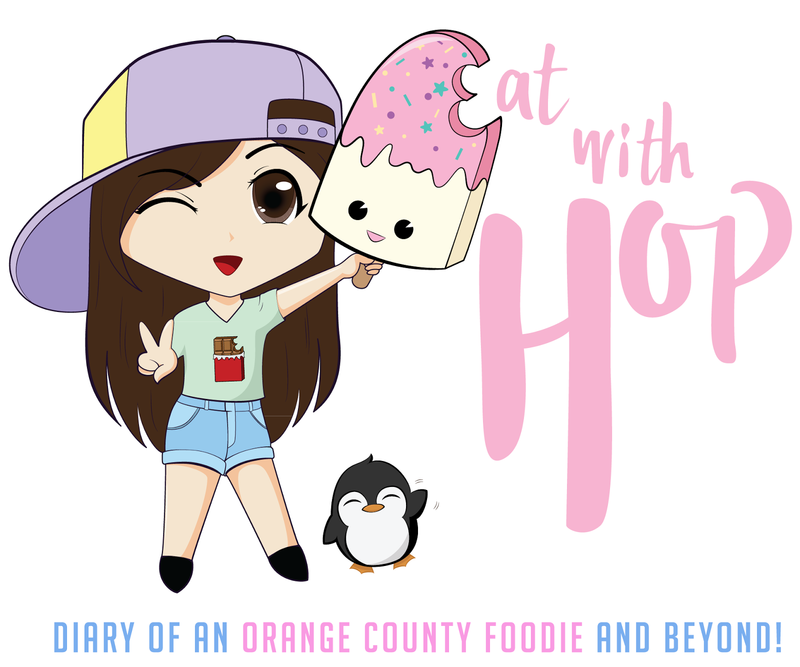 Last Minute Valentine's Ideas For Your Foodie Significant Other - EAT WITH HOP! If you're reading this, you're probably panicking just like I am, wondering what to do for Valentine's Day which is right around the corner, literally because it's tomorrow in just a few hours. No need to panic. Because you're not alone. Well, maybe we can both panic. But don't worry, let me do some research for you. Thanks to the `gram, I found this great creative idea from @Mr.Cheam! 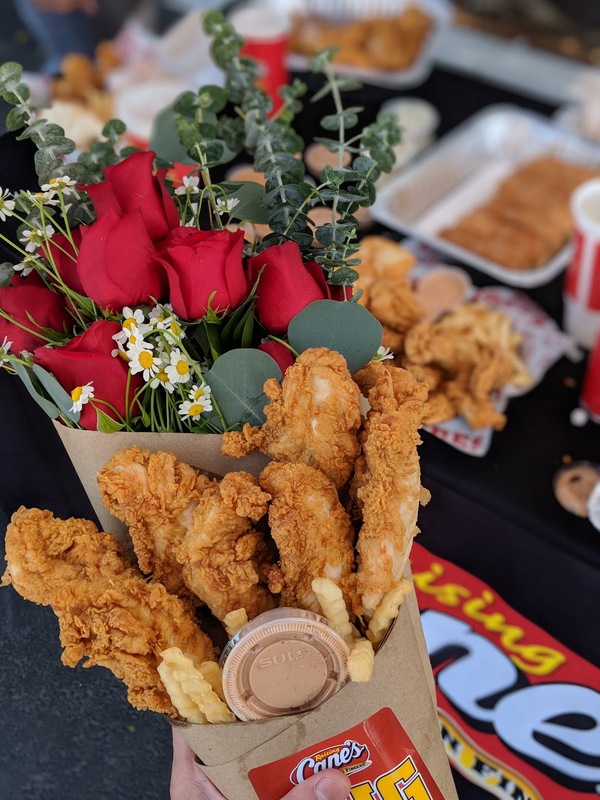 What spells love better than chicken tenders, amirite? In my opinion, edible gifts are better than any boring ole bouquet of just roses because if something's gonna wither way, at least it'll be in my stomach. 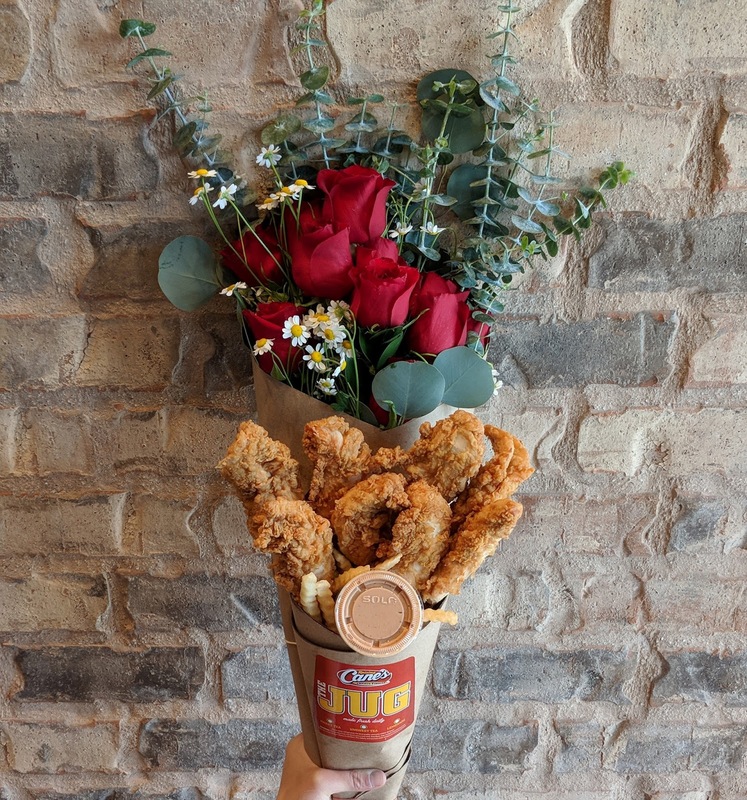 Raising Cane's chicken tenders are the perfect strips to gather in a bouquet. Your significant other will love it, no doubts. Visit Raising Cane's website to find a location near you. Honey and Butter is honestly my favorite place for macarons. Get your mack game on with their super duper cute Valentine's themed macarons which are available in store! These are sure to win hearts! And, they are delicious too! These macarons are not only super adorable and aesthetic, but are so fresh and soft and with a cream filling so smooooooth (just like your next move). Priced at around $4, these conversation hearts are worth it. They come in various flavors including oreo, matcha, and nutella hazelnut. If you don't eat them right away, they will last up to 3 days in the fridge and still taste amazing. Check out Honey and Butter on Instagram and their official website. Just give a pizza your heart to your crush, I dare you. Maybe you'll get your desired response. And if not? Well, at least now you can say you tried. On Valentine's Day, you can order a large heart-shaped pizza from Mickey's Deli for only $15.99 with additional toppings for $1.50 each. Check out Mickey's Deli on Instagram, Facebook, and their official website. Alright, I made this post reaaaally last minute. So for IDEA #4, I suggest you do this tip 4ever. Like, never stop showing you care. If you really got nothing, no idea at all, just show you care by doing the small things. Heck, do something special right now. Why does it have to be on Valentine's Day? Do something special everyday! For my Valentine's Day this year, Kevin and I are gonna be lowkey. No fancy dinners or anything but instead we are just going to buy some KBBQ Meat and cook it home! It's gonna be a relaxing day! IF YOU HAVE ANY SUGGESTIONS OR IDEAS, LET ME KNOW!